Good morning! Today I'm sharing a card featuring an adorable Birdie Brown stamp set from My Favorite Things. 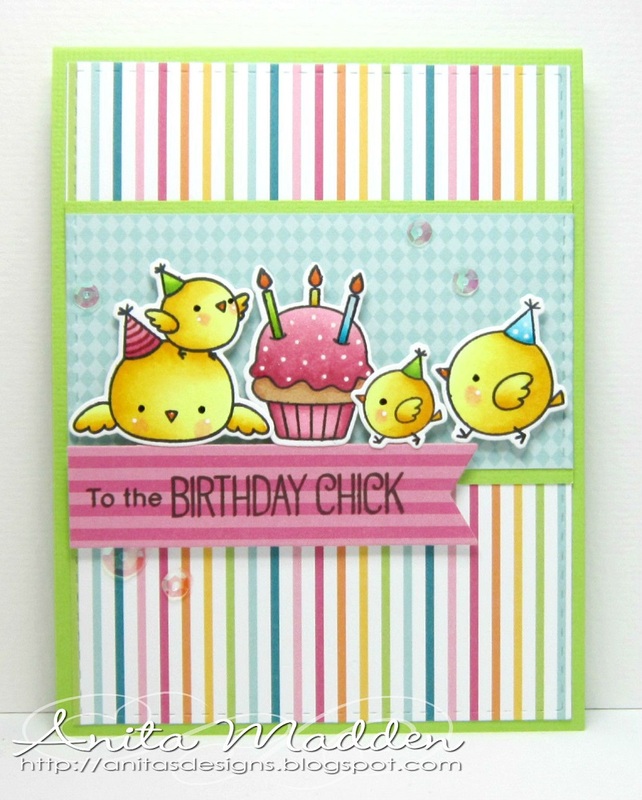 These adorable images are from the BB Birthday Chicks stamp set. Of course I always love everything Birdie Brown! I colored the images with copics and then diecut them with the coordinating die-namics. The pretty papers are from the Sweet Celebration Paper Pack ... I love the bright colors and pretty patterns in this pad. I used a black glaze pen on the birds' eyes. I used a white gel pen to create the white polka dots and highlights on the bird cheeks and cupcakes. I added a few sequins to my card for some sparkle.